CJ12. 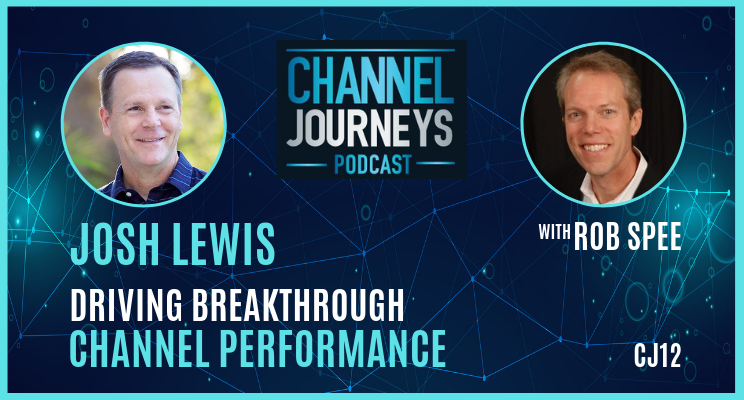 This episode features Josh Lewis, Vice President of Global Channels at Alteryx, an analytics firm on hyper-growth. 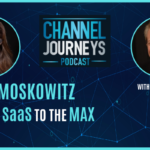 The channel strategy that got Alteryx to a $50M company wasn’t going to scale and continue fueling hyper-growth. The channel program reached a plateau. As a result, Josh needed to take a different approach to accelerate channel performance. Breakthrough performance is defined as a dramatic improvement achieved through consistent, focused, and synergistic efforts. Josh is adding fuel to a hyper-growth engine through consistent, focused, and synergistic efforts to drive breakthrough channel performance. This podcast is loaded with tips on recruiting, culture, and team alignment that you can use to accelerate channel performance in your own company. Cull non-productive partners who aren’t willing or able to re-engage and commit. Furthermore, take a data-driven, targeted approach to recruit new partners who have vertical industry expertise. Having a channel-friendly culture makes it easier to accelerate growth. Likewise, so does recruiting partners with cultures that match your company culture. Also seek ways to fuse your brand experience into your channel program. Align your channel teams and partners to the sales teams to gain sales relevancy. Also hire, train and coach your channel managers to drive breakthrough performance from their partners. [2:45] Alteryx an “overnight success” that started 23 years ago as a consulting company solving customer problems. Gradually shifted from services company to product company. Outside investment put them on hyper-growth track. Managing channels in hyper-growth requires special approach. Josh’s role is to add fuel to the growth engine. [5:00] Josh came into a good foundation of partners. However, what got them to a $50M company wasn’t going to scale. Needed to make existing partners more successful and bring on more. [6:55] Culture of partnering was there from the start. Josh found Alteryx to have a partner-friendly culture. But he needed to do more to make it easier for partners. Having the right culture in place makes it easier to accelerate. [8:20] The channel program reached a plateau. Therefore Josh needed to take a different approach. Had to be more selective about which partners can join the program. Needs partners who will build a practice; not single transaction partners. Understanding who shouldn’t be in the ecosystem as important as who should. [10:00] Culling old partners from your program is hard. Some are friends. But at some point it may not make sense for either side to continue. If partners want to reengage and commit, welcome them. But if not, it’s time to part ways. [11:00] Josh is getting hyper-focused and data-driven on partner recruiting. For example, he hired a partner development manager for healthcare. Spent months analyzing the most important characteristics and patterns of the ideal partner for that market segment. Then built a cadence with the marketing team to target those partners. They went healthcare events and made sure their value prop was crisp. Has had great results, finding and landing partners they couldn’t have otherwise. [12:00] They first looked at existing partners to see which ones were healthcare relevant. Then they used Alteryx’s own analytics to automate the analysis of partner data. Many happened to sell into healthcare, but weren’t healthcare partners. Wanted partners who woke up every day thinking healthcare and analytics. Analyzed industry reports, scanned websites, and attended events and trade-shows to develop a tight target list and hone value prop message. [15:20] Now he’s rolling out the same vertical-targeted recruiting model globally, targeting other verticals with collaboration between business development and marketing teams. [16:45] Also rolling out a new PRM system (Web Infinity) that will include full-blown deal registration system. This system is focused on the partner journey and allows them to segment partners by vertical. Can’t double staff, so needs systems that scale. [19:00] Also rolling out a new Partner Program in June, fusing the brand into the program. Want partner experience to mirror the Alteryx brand experience. More than just swag and t-shirts, its very much about getting partners aligned with how Alteryx views the customer. Building in measurements around customer success and certification. [20:30] Plans to start surveying partners this year to measure partner satisfaction. Have global partner advisory council to get feedback from their top partners and hold 3 partner summits. [25:30] Alteryx has a strong focus on land and expand. Hence partners play a major role in expansion. Rely on partners to have the deep industry domain knowledge to weave themselves into the customer’s analytic journey. [27:40] On hiring top talent, Josh looks for partner managers who have a big picture view. Looking for people who can run their own channel “franchise”, acting like a general manager of their region. Josh looks for sales relevance, meaning are his managers relevant to the direct sales team and to the partner. Not just managing transactions or the partner, but also working closely with the sales team. You have to hire people who understand that, who can develop trust internally with the sales team and externally with the partners. [30:00] A partner manager diminishes their value when isolated outside the sales motion. Align your channel team with the regional sales team to achieve the highest partner-attach rates and most productive partners. [31:15] Likes to hire partner managers with both a direct and indirect sales background. Hire people interested in the big picture with intellectual curiosity. Then empower and enable them to think as general managers running a franchise. [32:30] Sometimes we hire transactional channel managers. There’s a need and a role for that. But when you’re looking to double the business you absolutely need people who can lead breakthrough performance from partners. [34:30] Channel relevancy in a company is based on chief executives’ perception of the channel and their experience with the channel. Sometimes channel chiefs can get too hung up on an approach and it becomes almost a religious conversation. [36:00] The importance of culture and cultural fit – the partners who are most successful are the ones with the strongest cultural fit. Therefore, find partners who speak your language. Its hard to measure on a dashboard, but you know it when you see it. [38:50] Josh made a leap into sales after getting his English major by getting a job at Eastman Kodak and going through their 3-4 month sales training program. [42:20] Tips for channel managers looking to rise up the ranks – it’s a journey. Have a personal network, find the right mentors, be humble. Learn new things and learn from the hard lessons. Find a great company and surround yourself with great people.